Sitefinity CMS is a modern digital platform that is specially designed to increase user engagement and conversions easily and in a cost effective manner. It offers an intuitive and an experience management toolset within an easy to use interface thereby allowing the marketers and publishers to be more productive and effective. Since its first release, Sitefinity development has come up with regular updates and features in its latest versions. Sitefinity CMS HubSpot Connector will allow companies in India, UK, Canada and etc. to easily create and make changes in the Sitefinity CMS forms to trigger automated workflows and also send data in HubSpot. It gives the users complete control over the field mappings and reuse the same form across various campaigns by changing the API key that is associated with HubSpot. Defining the events and related properties is now very easy to maintain and much emphasis is given on simple and clean design. You can now benefit from simple management of events and calendars, enhanced list views, improved date and time pickers and etc. Related Blog: What to Expect from Sitefinity 11.1 Beta Release? You can now use Sitefinity CMS Security API and skip the authentication part and directly login a user. This feature is valid when you use a custom mechanism in order to authenticate your users that is external from Sitefinity CMS. 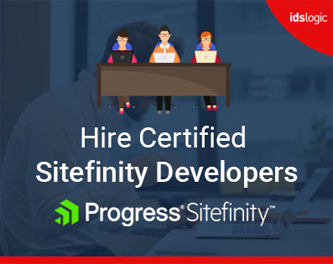 If you want to develop customized modules for your Sitefinity website, then you can take advantage of health check services and also integrate some custom codes in your modules. This will obviously increase the scope of your health check service and use it as a centralized mechanism for verifying the important functions of Sitefinity. You can now take a look at the most comprehensive set of Sitefinity CMS documentation, which will inform you about SiteSync concepts and processes and you can also learn about how to set up the work with SiteSync. You will also get the scope to see the videos that demonstrate complex, but key SiteSync configurations. Sitefinity users can now easily modify the settings of the rich text editor and this helps to enhance the user experience. The editor is built in Kendo UI and the configuration file is exposed and shipped with the Admin App. Sitefinity users can now localize the date, time and number custom field having different values and varied translations. This is especially helpful for regional date and time formatting. Operating from offices in India and the U.K., we have a team of Sitefinity developers having more than 11 years of experience. We are a Sitefinity award winning company and have helped clients to meet their specific business goals.